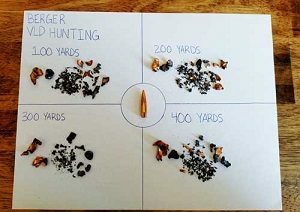 7mm STW 150 grain Nosler Ballistic Tip- The 7mm Shooting Times Westerner, sometimes referred to as the 7mm STW began as a wildcat rifle cartridge developed by Layne Simpson in 1979. It is an 8mm Remington Magnum case that has been “necked down” (narrowing the case opening) by 1 mm to accept 7 mm (.284 in) bullets. This cartridge is named after the magazine Shooting Times where Layne Simpson is a regular contributor. The 7mm STW graduated to commercial status when it was officially recognized by SAAMI in 1996 and quickly gained popularity among hunters interested in open country hunting, mountain hunting and dedicated long range hunting enthusiasts. 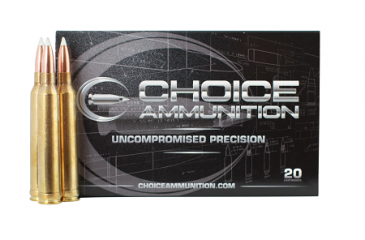 Choice Ammunition has taken our 100% hand-loading techniques and produce an extremely accurate, highly dependable round for the 7mm STW in this load. Our loading tolerances are only matched by passionate hand-loaders in their own loading rooms. Consistent seating depths, powder charges and proprietary formulas of Choice Ammunition, make this 140 grain Nosler Ballistic Tip round the best you can buy on the commercial market today. 7mm STW 160 grain Barnes TSX Triple Shock- The 7mm Shooting Times Westerner, sometimes referred to as the 7mm STW began as a wildcat rifle cartridge developed by Layne Simpson in 1979. It is an 8mm Remington Magnum case that has been “necked down” (narrowing the case opening) by 1 mm to accept 7 mm (.284 in) bullets. This cartridge is named after the magazine Shooting Times where Layne Simpson is a regular contributor. The 7mm STW graduated to commercial status when it was officially recognized by SAAMI in 1996 and quickly gained popularity among hunters interested in open country hunting, mountain hunting and dedicated long range hunting enthusiasts. 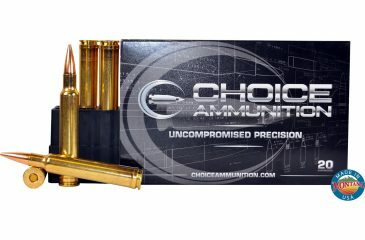 Choice Ammunition has taken our 100% hand-loading techniques and produce an extremely accurate, highly dependable round for the 7mm STW in this load. Our loading tolerances are only matched by passionate hand-loaders in their own loading rooms. Consistent seating depths, powder charges and proprietary formulas of Choice Ammunition, make this 160 grain Barnes Triple Shock TSX round the best you can buy on the commercial market today. 7mm STW 160 grain Nosler AccuBond- The 7mm Shooting Times Westerner, sometimes referred to as the 7mm STW began as a wildcat rifle cartridge developed by Layne Simpson in 1979. It is an 8mm Remington Magnum case that has been “necked down” (narrowing the case opening) by 1 mm to accept 7 mm (.284 in) bullets. This cartridge is named after the magazine Shooting Times where Layne Simpson is a regular contributor. The 7mm STW graduated to commercial status when it was officially recognized by SAAMI in 1996 and quickly gained popularity among hunters interested in open country hunting, mountain hunting and dedicated long range hunting enthusiasts. 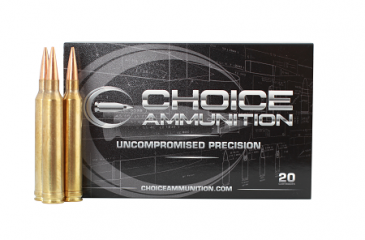 Choice Ammunition has taken our 100% hand-loading techniques and produce an extremely accurate, highly dependable round for the 7mm STW in this load. Our loading tolerances are only matched by passionate hand-loaders in their own loading rooms. Consistent seating depths, powder charges and proprietary formulas of Choice Ammunition, make this 160 grain Nosler AccuBond round the best you can buy on the commercial market today. 7mm STW 180 grain Berger VLD-Hunting- The 7mm Shooting Times Westerner, sometimes referred to as the 7mm STW began as a wildcat rifle cartridge developed by Layne Simpson in 1979. It is an 8mm Remington Magnum case that has been “necked down” (narrowing the case opening) by 1 mm to accept 7 mm (.284 in) bullets. This cartridge is named after the magazine Shooting Times where Layne Simpson is a regular contributor. The 7mm STW graduated to commercial status when it was officially recognized by SAAMI in 1996 and quickly gained popularity among hunters interested in open country hunting, mountain hunting and dedicated long range hunting enthusiasts. 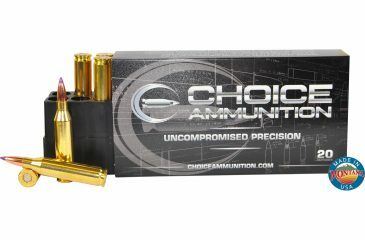 Choice Ammunition has taken our 100% hand-loading techniques and produce an extremely accurate, highly dependable round for the 7mm STW in this load. Our loading tolerances are only matched by passionate hand-loaders in their own loading rooms. Consistent seating depths, powder charges and proprietary formulas of Choice Ammunition, make this 180 grain Berger VLD-Hunting round the best you can buy on the commercial market today.